Oz Metal Art & Weathervanes For SALE - Metal Wall Art, weathervanes and signs. Weathervanes for sale. Choose from our standard designs or have us make a unique custom weathervane especially for you. 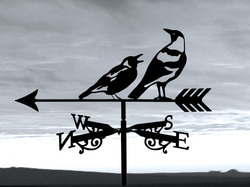 View our range of Australian made metal art Weathervanes for sale. If you would love to see your own design idea become a reality just use our Special Request Form by clicking here and we will get back to you ASAP.